NASA’s New Horizon's spacecraft may have passed Pluto, but it has not stopped surprising scientists. 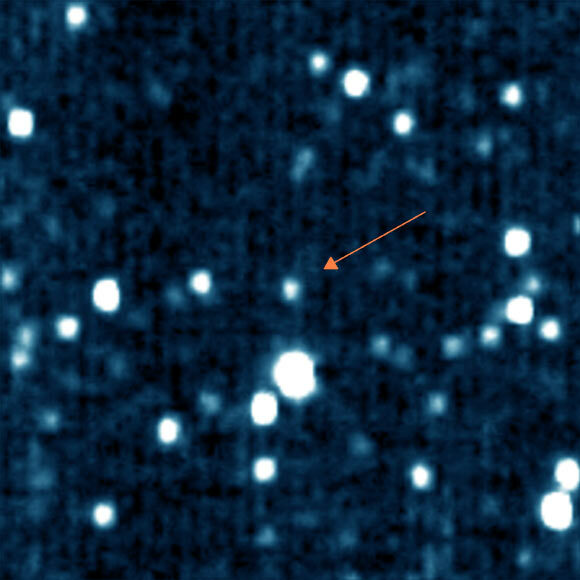 It lately took the closest images ever of a distant Kuiper Belt object, capturing a bizarre object passing some 3.3 billion miles from the sun. Researchers say the object, titled 1994JR1, is a 90-mile (150-kilometer)-wide ancient body. According to NASA’s scientists the video demonstrates its capability to observe several such bodies over the next numerous years if NASA accepts a comprehensive mission into the Kuiper Belt. When these pictures were made, 1994 JR1 was some 3.3 billion miles (5.3 billion miles) from the sun, but only 170 million miles (280 million kilometers) far from New Horizons. This false color picture shows the minor planet/plutino 1994 JR1 (arrow). Image credit: NASA / Johns Hopkins University Applied Physics Laboratory / Southwest Research Institute. This may not seems much to you but this actually sets a record, by a factor of at least 15, for the closest-ever image of a minor body in the Kuiper Belt, the solar system's 'third zone' beyond the internal, rocky planets and external, icy gas giants. Mission scientists are using images like these to study several more ancient Kuiper Belt objects from New Horizons if an extended mission is permitted. New Horizons is currently on course for a close flyby of another Kuiper Belt object, 2014 MU69, on Jan. 1, 2019. It orbits nearly 1 billion miles (1.6 billion kilometers) beyond Pluto. NASA and the New Horizons group scientists selected 2014 MU69 in August as New Horizons' next possible target, thus the nickname PT-1. Like Pluto, MU69 circles the sun in the frozen, twilight zone called the Kuiper Belt. MU69 is believed to be 10 times bigger and 1,000 times more massive than regular comets, counting the one being circled right now by Europe's Rosetta spacecraft.